4:30 p.m. ET 5 p.m. Live interview on WRKO Radio 680 AM / Boston with talk show host Howie Carr. 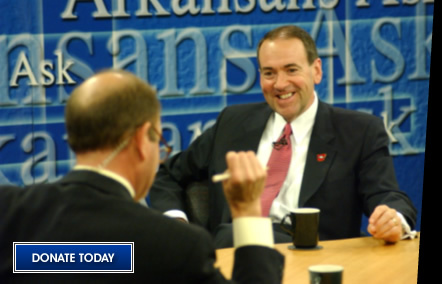 On Sunday, January 28, 2007, Mike Huckabee appeared on "Meet the Press" with Tim Russert. To read a transcript of that program, click here. Mike Huckabee, only the third Republican to serve as governor of Arkansas since the Civil War, developed an impressive list of accomplishments while working with a Democrat-dominated legislature. To read more, click here. In August of 2005, Mike Huckabee delivered an address to attendees of the Strafford County Republican Picnic/Pig Roast at the beautiful Three River Farm in Dover, NH. To read a transcript of that speech, click here.